This product was added to our database on Wednesday 27 july 2016. As Allied forces closed on Germany from all sides and the war in Europe was coming to an end, there was one thing that frightened German servicemen more than anything else – capture by the Red Army. Luftwaffe pilot Eugen Lorcher had no intention of letting this happen and on the evening of 8th May, he fuelled up his Focke-Wulf and prepared to escape to the west. Taking off from their home airfield in the Czech Republic, Lorcher had also bundled his fiancée into the radio compartment of the aircraft and they made their bid for relative safety. The aircraft was flying at very low level, to avoid being shot down by Allied fighters, but Lorcher feared destruction at any moment, as they were taking ground fire and in danger of simply striking the ground. Gaining height at the last moment, in an attempt to find a suitable landing spot, the Focke-Wulf belly-landed in a field near the parental home of Lorcher – both he and his future wife walked away from this incredible incident, with their war finally over. As RAF pilots began to report the appearance of a new German fighter in the skies above Europe in the summer of 1941, they could not have known how significant this would become. 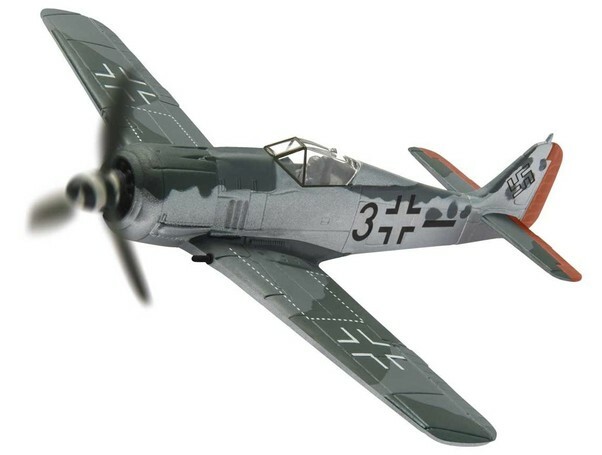 For the next year, the Focke-Wulf Fw 190 would rule the skies and claim a heavy toll of RAF aircraft in the process. The increased loss rates were causing huge concern, when a Focke-Wulf pilot became disorientated, following combat with Spitfires over southern England and inadvertently landed his pristine machine at RAF Pembrey – The RAF had their Focke-Wulf! Following exhaustive testing of the captured aircraft, a new Spitfire was developed, which was capable of taking on and beating the new Luftwaffe fighter. The Spitfire IX proved to be more than a match for the Focke-Wulf and for a short time, the balance of power shifted again.